When Scott Ballard started school, his teachers told him he would never amount to anything. However, Scott overcame the struggles of his youth, learning to live a life of gratitude, to follow his God-given ability, and to embrace his dyslexia as a gift rather than a disability. By sharing his own journey to confidence and fulfillment, Scott will show you how to start on a path toward achieving your dreams, creating your legacy, and living in your God-given ability. You can change the world, and you can start your journey today. The title of this book is key! A key to understanding why the author can unlock the greatness in himself and in others. The author’s vulnerability and honesty about his childhood and adulthood encourage others to look honestly at their own pain, trials and tribulations..without pity or remorse. His persistence, his hard work, his good choice in a partner and his faith all worked in his favor over time. Its like a Cinderella story for dyslexics. As someone who has worked in the field of dyslexia and neuroscience for 30 years, I know the problems facing people with learning challenges, I know how those problems pervade their personal and professional lives. And I know how silently they suffer without being fully understood or appreciated. I also know that change is possible and that dyslexia can be reversed in many cases with the right attitude, the right help and the right support. It is heartwarming and gratifying to see how Scott has demonstrated the determination and fortitude necessary for long term success. His story is encouraging to others, My hat is off to him. Scott’s life and this book are prime examples of how a positive attitude and perseverance can have a massive impact on the world. If you are looking for motivation, or are struggling with self doubt, this book will give you the booster shot you need to turn things around. In a world that says “you can’t,” Scott shares an inspiring and heart-warming story of his own life where he overcame limitations put on him by others, shares his faith and how overcoming fears, failures and limitations opens up great opportunity and leads to growth. Scott’s story will inspire, encourage and motivate you as you face challenges and obstacles in your own life. I really enjoyed reading this as Scott brings things that are applicable to each of us to light in his own story. I always find real life stories that hold applicable truths the most impacting to me. This was an easy read and felt more like I was having a conversation with Scott at a coffee shop than just reading his book. Our limitations really do start with ourselves first and move outward. This book gave me a lot to think about and reflect on as I read and continue to think about. Very encouraging and inspiring read, I started reading and couldn’t put it down. A story of overcoming struggles and creating success. Scott’s open and honest experiences help create an attitude of gratitude. A MUST READ!!! This book takes you down a journey of man’s heart and understanding, through life experiences that his “normal’ might just be the same kind of “normal” other have experienced. Learning disabilities are often misunderstood or masked. Or perhaps not a “disability” but exactly how God designed you. Learning how to work and function in a world that does not always understand is a challenge many face in the workplace. Scott helps the reader identify characteristics about yourself, as well as solutions and direction. Scott Ballard has shared his journey from a young boy struggling to fit in and understand his world to a successful entrepreneur who wants to share his story to help others. Raising four boys of my own I found this book to help me in understanding my own boys. One boy in particular is my 14 year old. I left this book on his nightstand and said, “I would like you to just read the first chapter. and then give the book back to me.” He went on to read the entire book. In his words, “Mom, this man understands me.” You see as a mom of teenage boys attitude is everything. With our colleagues right across to our children and ourselves we have choices, based on our understanding, of what attitudes will move us ahead. Scott’s open and honest experiences help create an attitude of gratitude. A MUST READ!!! THE BIGGEST DISABILITY IS A BAD ATTITUDE is a Must when building your library! I have to say that I really enjoyed Scott Ballard’s book, THE BIGGEST DISABILITY IS A BAD ATTITUDE. I greatly appreciate how Scott helps those of us with different forms of learning, accept and embrace it as a strong and positive quality that the world needs, especially with the times we are in. I love the transformation of mindset Scott gave me as a reader, by continually using what the world calls a disability as a strength and blessing. Coming from a professional athletic background, involved in business and still trying to balance with a full family, I needed to find clarity, direction and my strengths so that I could reach my full potential in all areas of life. This book is being read by my 17 year old daughter, wife and myself. I will be passing it along to business partners and friends as well. I look forward to growing and fully developing my God given ability with the assistance of “The Confident Coach” and utilizing my abilities to bless as many as God will call. Thank you Scott Ballard and may the Lord continue to bless you and your family more abundantly. Scott Ballard is an encourager, a bright spot in your day, a man who knows how to instill confidence in those who so often sorely lack it. But can he bring that kind of “glad you’re in my life” gifting to the books he writes? By honestly and forthrightly describing his own struggles with self-worth–dating from his difficult elementary school years–and showing how he’s learned to use a significant “disability” (dyslexia and the accompanying educational challenges) to find far more significant success, Scott lives out the title of his book: The Biggest Disability is a Bad Attitude.” If anyone has a “right” to wallow in a bad attitude, it would be Scott; and yet he’s learned how to take the “slings and arrows of outrageous fortune” and use them to achieve not only success, but significance. Give this book to someone who needs a boost of confidence, a shot of adrenaline, or even a real-world example of someone who overcame the odds to find and enjoy a life full of both service and satisfaction. If the typeset book “looks” different from the norm, it’s because Scott has chosen to use a font especially designed to make reading a little easier for those who, like him, struggle with dyslexia. I’d never heard of the font. But even this detail is typical of Scott: going out of his way to help others succeed. A pleasure to recommend. A read that will change your life purpose! There are few who have been exposed to real life challenges and yet manage to not only succeed but have the ability to share and truly help others. 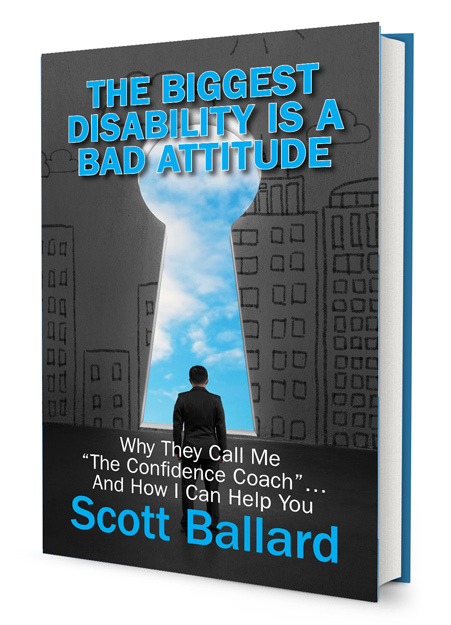 Scott Ballard, in his latest book, The Biggest Disability is a Bad Attitude is such a person. His keen sense of correct principles and calm demeanor enables the Confidence Coach to provide a renewed path to all who seek to understand their true purpose. This is a must read for everyone. Scott Ballard uses his story to help others overcome obstacles and disabilities in their lives that most could never dream of. The power and grace of God is central to identifying what the obstacle is and turning it around to a story of redemption and success. After reading The Biggest Disability is a Bad Attitude my life will never be the same. We have a grandson with a disability and Scott’s wisdom in these pages drives me home to finding joy in each step forward and every glimmer of hope. Wonderful book! Great way to refocus life in a very positive way!